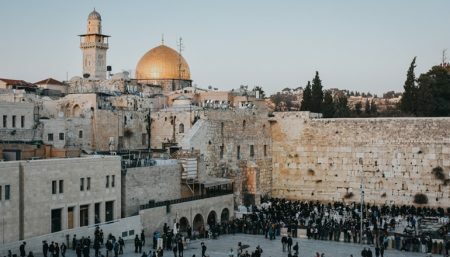 If you’re in Jerusalem and looking to enjoy an experience like no other, soak up the authentic Jerusalem atmosphere and some history – The Templer Inn is the perfect hospitality venue for you. This is an old 19th century house, located in the intimate and picturesque German Colony neighborhood, across from the restaurant-packed First Station compound and within walking distance of the Old City and the Western Wall. The Templer Inn occupies the original historical structure which has undergone preservation and a renovations process which has maintained its original features while at the same time updating it to a small, luxurious, exclusive family-run complex of suites. So Which Suite Is Right For You? Each of the four suites in the Templer Inn is equipped to give you a historical experience combined with maximum comfort. Awaiting you in each suite is a bedroom with a twin bed, a living room with a sofa that unfolds into a spacious bed, a kitchenette with all the appliances you need and a bathroom – so that it’s fit to host single travelers, couples, families or businessmen. In addition, a rich country-style breakfast will be served in the expansive courtyard or in your room, as you choose. 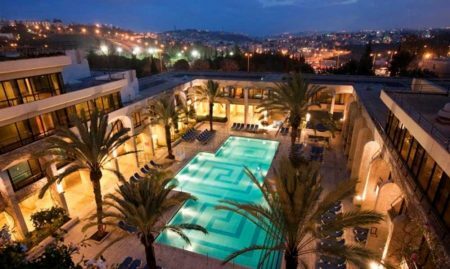 At the Templer Inn you get a chance to experience old-time Jerusalem, in a perfect central location and in a quiet, unique home-style atmosphere. Looking for an intimate venue for your event? The Templer Inn’s courtyard offers a picturesque outdoor event venue for up to 70 guests. Perfect for birthdays, brit/brit mila, bar-mitzvah, product launches, and more. Book your vacation at the Templer Inn and get 25 % off the second Night! The offer is valid by phone only: +972-72-3932879. Don’t forget to present the promo code. By staying at the Templer Inn for 5 nights we happily experienced a Jerusalem below the “tourist” level. We did visit the Old City and the Israeli Museum and Masada and other sights. But the richness of the visit came from getting to spend time with our hosts, Alon and Revaya. Every morning they filled our table located in their sunny garden with specialties as yogurt with granola, olives, homemade pastries and bread, hummus, spreads, salads, vegetables, grapefruit juice, lemon jam, and more. They talked with us over breakfast about the history of the old German Colony neighborhood founded by the Templers, his family’s move in 1951 to the house that was built by the Templers, Templer architecture, their family including their three children, the city, politics. As Alon said: “We’re Israeli. You can ask us anything.” Following their recommendations, we shopped for marvelous cheese and wine on nearby Emek Refaim Street, walked in the neighborhood to see the old homes, reached the walking trail converted from the railroad tracks and visited the compound, now museum and park, that used to be a home for lepers. Plus, the 3-room “apartment” consisted of a front room/kitchen, bedroom and bathroom. A wonderful “home” to relax in at the end of the day. We couldn’t have been happier! I was traveling with a friend and we loved staying here. It is a great location, the room was clean, quiet and spacious. The breakfast was incredible and the hosts could not have been more welcoming. This will be my "go to" in Jerusalem from now on! We spent 8 days at our Jerusalem ‘home away from home’ and loved every minute of it. It was built from the local stone, well over a century ago and is furnished to reflect the city and Israel. The location is brilliant .. you can walk nearly everywhere if you’re reasonably fit .. with lots of eateries and essential shops close by. Breakfasts were typically delicious local fare and far too big to devour everything every day. On the days we had early starts for tours, hosts Alon and Revaya provided us with a prepared Breakfast in our rooms the night before. They were wonderful hosts, providing sage advice, arranging bookings and always eager to hear about our daily adventures .. to get some tips for future guests. The Templer Inn’s not cheap, but we found it so much more friendly, welcoming and comfortable than a flash hotel, especially if you’re staying more than a couple of nights. For us, it was worth every cent. The largest suite in the inn, comfortably accommodates up to four people. Air conditioning and TV in each room, a fully-equipped kitchenette (including a microwave, stove, kettle and a coffee maker) and a large desk make it ideal for a family or an individual, traveling for tourism or business. A beautiful and stylish suite, filled with the atmosphere of the past and all the comforts of the present. Air conditioning and TV In each room, a fully-equipped kitchenette (including a microwave, stove, kettle and a coffee maker), a desk and a dining table allow you to experience the history of Jerusalem with the luxuries of present day. The most original suite of the inn, with arched ceilings and colourful stone tiles. The suite has especially thick stone walls that maintain a relative coolness in the summer and warmth in the winter. There is also a TV and air conditioning in each room and a fully equipped kitchenette (including a microwave, kettle, hob and coffee maker). Possibly the most unique unit, this suite was created out of the cistern of the house. Three steps lead into a cozy living room with a fully-equipped kitchenette, with stone tiles and an arched ceiling. The bedroom provides a peaceful haven after an energetic day of activities.